No.1 Comma after MAFEKING; F, E, K broken (K conspicuously across both legs); E of BESIEGED broken at lower corner. No.2 Comma after MAFEKING but often looking like a period and always, otherwise, blurred; no other breaks or defects. No.3 Comma after MAFEKING; B of BESIEGED damaged, looking like figure 8; in some copies E of MAFEKING has curved top and first E of MAFEKING lacks serif at right bottom. No.4 Comma after MAFEKING; back of G in BESIEGED is broken; bottom stroke of E in MAFEKING is chipped on top side. No.5 No comma after MAFEKING; BESIEGED almost BESIEGFD by missing serif on bottom of E.
No.6 No comma after MAFEKING; final E of BESIEGED conspicuously dented in at left top, often appearing as if corner is missing. 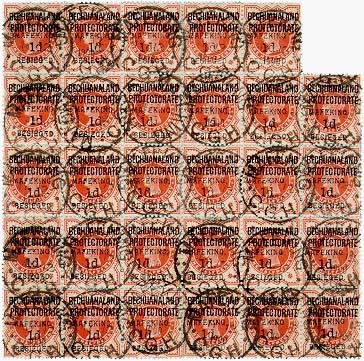 This is the largest known block of any Mafeking stamp known to exist. It has come from the collections of Freund and Maria de La Queillerie. 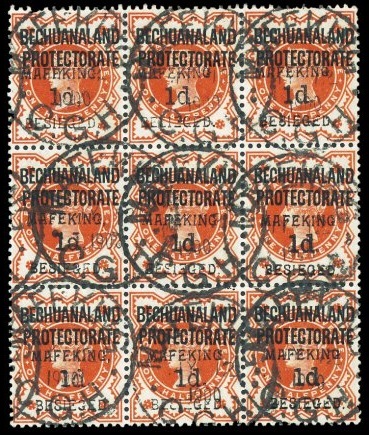 A horizontal strip of six showing the complete setting, on piece with “AP 13” cds., folded between three stamps, fine, cert. Brandon (1993). History: Harmers SA February 1994 lot 1528 SFr1’300; Harmers of London 9th Jul. 1997 lot 929 est.£500; Spink (12 January 2011 lot 236 realised £650+20%); currently for sale by David Brandon for £1’600.